I recently led an in-house “lunch and learn” about Google+. I know what you’re saying, “Wait a minute … Google+ is still around? And marketers actually give attention to it?” Well, yes and no. Or, no and yes. Let me explain. First and foremost, let me say that I am an incredible advocate for not using particular social media networks. Most business owners (and even some marketers) have this twisted notion that they must be registered with and active on any and every social network that exists. “MySpace to Facebook and YouTube to Vine, if it exists than I have got to have my place in their digital network.” Wrong answer. The first rule of marketing, and this goes hand-in-hand when we discuss social media marketing, email, and content marketing, is that you discover your audience. What does your audience “Like” and “Follow”? Bonus points if you know what they dislike! How does your audience communicate? These questions and more have to be answered before you decide on what social networks are best for you. A great blog that I follow recently posted about this very topic, How to Know Which Social Channels Are Right for Your Business, and would be an excellent read for anyone in the world of Social Media Marketing (that should be you!). Google is King: In the world of search, Google is king. Nobody even compares. At present, Google completes over 40,000 search queries every single second. Every. Single. Second. As a business owner, you are going to want to leverage any means you can to capitalize on their every expanding search engine. In this same breath, I would like to add that Google prioritizes their own social network over that of others when populating search results. They even place Google+ information right in line with page links — keep reading to learn about this. Play by their rules and nobody gets hurt. Google+ SEO: I will not go too detailed here, but in a recent MozCon lecture Mark Traphagen pointed to the fact that, unlike many other social media profiles pages, your Google+ page actually has meta attributes (i.e., Meta Title, Meta Description). Your Google+ page is indexed by Google crawls. And your Google+ page acquires its own pages authority in some form. What am I getting at? The more relationships that you build and the more authority that your page has should directly impact the website(s) that your profile is linked to. All that to result in higher rankings. Google+ in Search Results: Speaking of SEO and being discovered when your potential shoppers are searching on Google, it is important to make note that your Google+ profile and Google+ posts will show up in search results. Maybe you recall using Google to search for a local business or service. The normal list is populated down the left of the page but to the right is displayed images, a map, hours, reviews and much more — This is referre dto as a Knowledge Graph. That knowledge graph to the right works hand-in-hand with Google+. What is more, the Google search results that populates to the left will add Google+ page information alongside the website URL. 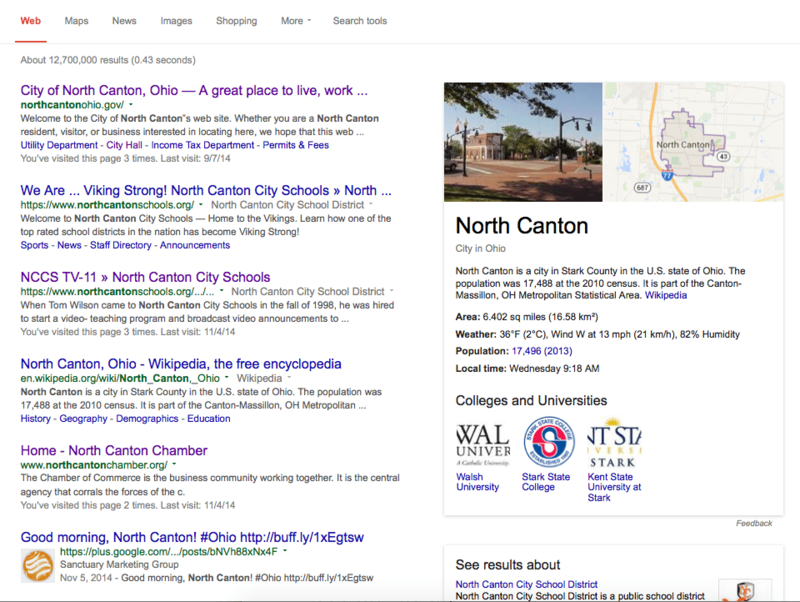 In this screenshot, I used the term “North Canton” as my search. Not seeking a particular business or service, here are the results that I was served by Google. 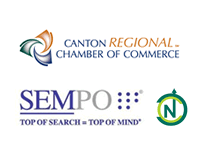 Notice that a recent Sanctuary Marketing Group post from Google+ is included right under local schools, a Wikipedia entry, and the North Canton Chamber of Commerce. This is a great place to be! As a second example, I decided that I need to look for a new kitchen table. I want to shop local to save on shipping costs and I search Google for “north canton furniture.” A simple, straight forward inquiry that should display local stores. In reviewing the screenshot, why might I choose to shop at Value City Furniture over Levin Furniture? Remember: Shoppers make decisions on the fly based on the information that they are given. In this case, as with the case of other local stores, Google has pulled reviews from their Google+ page and shares those views in their search results. 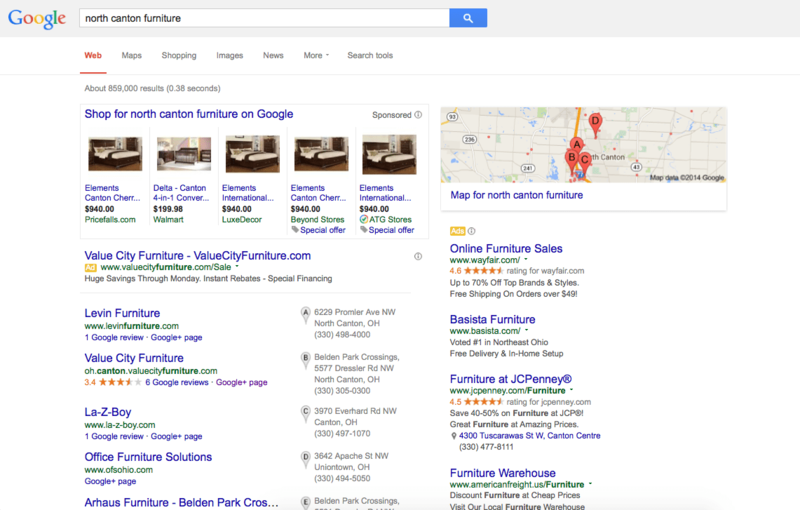 A positively reviewed store stands a much better chance in search results! Google+ +1: Much like Facebook has begun to do, if you “+1” something that your friend has shared than it is likely that a rippling effect will occur and that item will be shared within your circles. Like the old saying concerning the butterfly effect, the wind created by a butterfly flying creates a storm on the other side of the world. Your activity stirs motion in other parts of the Web. “Jason has just +1’d this kitten image.” Mark Traphagen discusses this point in detail over at Social Media Today. But Jason, Google+ is Lonely! I hear it all of the time. People aren’t active on Google+ like they are on Instagram, Twitter or Facebook. I am not naive. I understand that more time is spent on other channels. I understand that at times it feels as though you are sharing Google+ status updates with an empty room. That room that appears empty is being searched around the world more than 40,000 times a second. The fact that others have not yet capitalized on Google+ is all the more reason to do so yourself. Move in. Set up shop. Grow your following. And then consistently post quality content. Experts do not foresee Google+ going anywhere anytime soon, especially since it is being integrated across the board (Google Search, Hangouts, Calendar, Inbox and so much more). Why don’t you start by adding me to your community? I would love to connect on Google+!